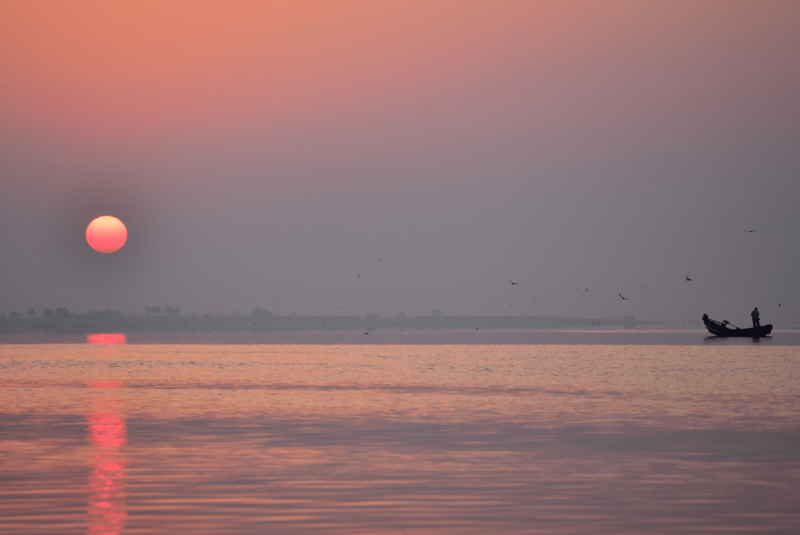 With Global Fishing Watch, we can now see beyond the horizon. A collaboration between SkyTruth, Google, and Oceana launched in mid September, it’s a publicly available platform that uses satellite data to track fishing boats around the world. Kroodsma will be discussing the project at a Nereus Program seminar held at the University of British Columbia’s Green College on October 27. This seminar is free and open to the public. 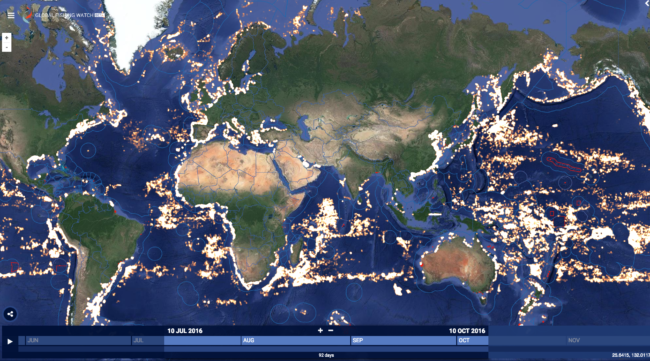 Global Fishing Watch is essentially like Google Maps for the oceans. The timescale shows segments of time, from days to years, back to 2012. Fishing activity shows up as yellow dots. Hovering over a cluster of dots shows connected lines – the track of a fishing boat. Clicking on that track brings up information of the vessel – such as name, identifications, and flag. The map also shows marine protected areas and exclusive economic zones and can be filtered by country. For example, it’s possible to see the track of a boat leaving from Shizuoka, Japan, named Kaio Maru No. 81 cross the Pacific, fish off South America and go to port in Lima, Peru a few times. Kroodsma notes that a challenge is that AIS information is self-entered by the user, so there can be mistakes or missing data. The AIS system can also be turned off but Global Fishing Watch can highlight this as suspicious behaviour. Turning off AIS can also lead to questions about whether that boat should continued to be insured. Global Fishing Watch is the first time that this data has been used to get a scale of global fishing efforts. 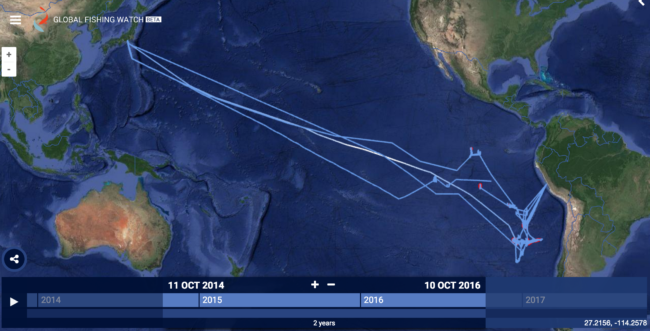 Illegal, unreported, and unregulated (IUU) fishing could also be spotted with this tool. This is essential information since 30% of global fish catches goes unreported, according to Sea Around Us, a Nereus Program collaborator. Without accurate information about fish catches, it’s difficult to understand the state of oceans and fisheries. Global Fishing Watch can be used to track fishing vessels from certain countries, such as this ship called Kaio Maru No. 81, from Japan. Screenshot from: Global Fishing Watch. There are a few commercial companies that provide AIS data. SkyTruth buys the data and then processes it; their goal is to make as much of our data freely available as possible. They’re also curating lists of fishing vessels from different sources, such as individual countries and regional fisheries management organisations (RFMOs), to match up information and have a more complete database. Learn more about how big data can aid fisheries management when David Kroodsma speaks at UBC’s Green College on October 27. Global Fishing Watch uses Automatic Identification System (AIS) data – a system originally developed to prevent collisions at sea. Boats use AIS to broadcast information about who they are and what they’re doing; the messages can include information about the name of the ship, identification numbers, position, speed, and course. 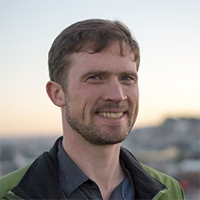 More about David Kroodsma: David has over a decade of experience researching and communicating global environmental issues. Trained in physics (BS) and earth systems science (MS) at Stanford University, he has worked with several nonprofits and foundations as a researcher, consultant, and data journalist, all with the aim of addressing global environmental challenges. A long distance cyclist, he has also used continent-crossing bicycle journeys to draw attention to climate change through his Ride for Climate project, and he is the author of The Bicycle Diaries, a Shelf Unbound Notable Book of 2014 and a finalist for both the Montaigne Medal and Forward Review’s IndieFab Book of the Year. He lives in Oakland, California.